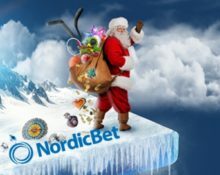 NordicBet – Christmas Calendar 2017! Enjoy two presents every day! Not one, but two presents are waiting every day at NordicBet, one for the Casino and one for the Sportsbook. Plus every claimed present will award one ticket to the Grand Christmas Raffle on 27th December 2017 where two lucky players will win One Million Kroner or €100,000 Euro. Collect as many tickets as possible to increase your chances to win one of the main prizes. 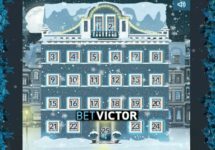 Casino Present – Wager Reward: Wager €20 on any game in the casino or live casino to instantly receive a €10 bonus, plus one ticket to the Christmas Raffle. Wagering requirement is 10x bonus within five days, subject to the NordicBet casino bonus terms and conditions. Sportsbook Present – Risk-Free Bet: Deposit minimum €20 in a single amount to instantly receive a €10 risk-free bet that can be placed on any sports or live betting. In the event that the bet is lost, the €10 will be credited to the account with no wagering requirement. On a winning bet, the total amount including the stake will be paid out with a wagering requirement of 3x the winning amount at minimum 1.5 odds within 14 days. NordicBet Sportsbook bonus terms apply. Casino Present – Trolls Bridge Race: Score the highest single coin win on Trolls Bridge at any bet size to place in the TOP50 on the leader board. Prizes range from €150 – €250 in cash and €25 – €125 in bonus money, credited by 18:00 CET on Monday. Wagering requirement for the bonus prizes is 10x bonus amount within five days, subject to the NordicBet casino bonus terms and conditions. Sportsbook Present – €10 Free Bet: Place one bet of €10 with minimum odds of 1.50 to instantly receive a €10 free bet that can be used on any sports event until midnight on Sunday. Winning bets minus stake will be paid out as bonus. Wagering requirement is 3x winnings with minimum 1.5 odds within 14 days. NordicBet Sportsbook bonus terms apply. Casino Present – OPT-IN and deposit minimum €10 to instantly receive 100 Free Spins on Finn and the Swirly Spin™. Wagering requirement is 35x FS winnings within three days, subject to the NordicBet casino bonus terms and conditions. Sportsbook Present – Wager minimum €20 with odds of 1.50 and higher in the LIVE lobby to instantly receive a €10 Free LIVE bet to be used by midnight. Only winnings from the Free Bet will be paid out as bonus with a 3x wagering requirement at minimum odds of 1.50 within 14 days. NordicBet Sportsbook bonus terms apply.